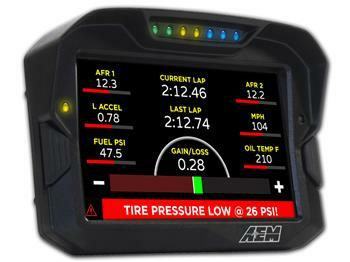 AEM CD Digital Racing Dash Display UNIVERSAL - Pann Auto Performance - San Diego largest aftermarket automotive performance parts - What do you drive? The CD-5/CD-7 color digital displays feature a super bright, high contrast, sunlight readable display and include an integrated glare diffuser and shade hood so that they are readable in even the brightest daylight conditions. They are designed to accept channels from CAN bus connections and do not include analog inputs. Two CAN bus channels are included so that it can receive and collect data from AEMnet enabled devices such as the Infinity ECU, Series 2 EMS or EMS-4, and 3rd Party Devices (see Supported Apps Tab), including PDM’s, CAN sensor modules and programmable engine management systems. Third-party systems will require download of 3rd party DBC CAN bus protocol files for proper operation if they are not included in our setup software. We currently have over 150 validated 3rd party applications, and offer a CD-7 Power Cable to simplify the installation of 3rd party devices. We have also developed 3rd Party Plug & Play Adapter Cables for certain applications, which are highlighted on our Supported Apps Tab and can be viewed on our Install Kits Tab. Seven ultra-bright LEDs span the top of the display housing for RPM and shift light indication. Users can program them to ascend in specific increments based on RPM range, and flash when it is time to shift. Brightness is user programmable on the fixed color LEDs. Two large buttons are included on the face of the display, allowing easy page changing and memory resetting even with driving gloves on. These button functions are also duplicated on the rear connector allowing the user to mount remote buttons on the steering wheel if desired. Two additional programmable LEDs are located above the toggle buttons on the sides of the housing.